What Is the Quote on the Statue of Liberty? There are two inscriptions on the Statue of Liberty. One is on the tablet Lady Liberty holds in her left arm, and the other is on a bronze plaque displayed at the Statue of Liberty exhibit. 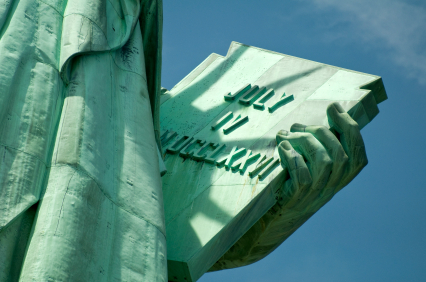 The Statue of Liberty holds a torch in her uplifted right hand and a tablet cradled in her left arm. The date of the Declaration of Independence is inscribed on the tablet in Roman numerals - JULY IV MDCCLXXVI (July 4, 1776). The granite pedestal upon which the statue stands is 89 feet tall. In 1883, in an effort to raise the money to construct the pedestal, Emma Lazarus wrote a poem called "The New Colossus." Persuaded by fundraiser William Maxwell Evarts and friend/writer Constance Cary Harrison, she donated it to an auction of art and literary works to aid in the pedestal fund. Not like the brazen giant of Greek fame, with conquering limbs astride from land to land; Here at our sea-washed, sunset gates shall stand a mighty woman with a torch, whose flame is the imprisoned lightning, and her name Mother of Exiles. From her beacon-hand glows world-wide welcome; her mild eyes command the air-bridged harbor that twin cities frame, "Keep, ancient lands, your storied pomp!" cries she with silent lips. "Give me your tired, your poor, Your huddled masses yearning to breathe free, The wretched refuse of your teeming shore, Send these, the homeless, tempest-tost to me, I lift my lamp beside the golden door!" The first two lines refer to the Colossus of Rhodes, a statue of the Greek god Helios, which stood in the city of Rhodes in Greece. This statue, which was about 107 feet tall, was one of the tallest statues in the ancient world, and was therefore considered one of its seven wonders. It was destroyed by an earthquake in 226 BC. At 151 feet tall, the Statue of Liberty is more colossal than the Colossus of Rhodes and stands not for conquering power as he did, but for welcome and hope. She tells ancient Greece to keep her "storied pomp" and give her instead, the tired, poor and homeless. Where Is the Sonnet Plaque Now? When the Statue of Liberty Exhibit opened in 1986, the plaque containing Lazarus's poem was moved to the exhibit along with the original torch and flame, although the flame had been greatly altered by that point. You can see the plaque and torch in the exhibit if you visit Liberty Island in New York. Although the statue was not originally intended to be a symbol of immigration or hope, but rather a symbol of friendship between the United States and France, the sonnet on the plaque has forever changed her purpose. "What Is the Quote on the Statue of Liberty?." YourDictionary, n.d. Web. 20 April 2019. <https://quotes.yourdictionary.com/articles/quote-on-statue-of-liberty.html>. Who Is the Only U.S. President Born on July 4? How Did Thomas Jefferson Die?